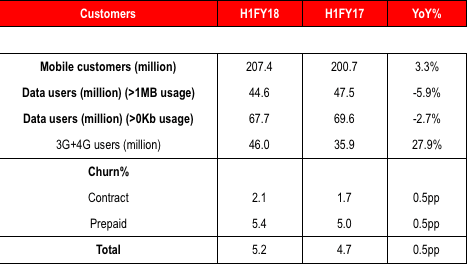 Vodafone India today released its half year FY18 results, in which it reported a decrease of 15.8% in service revenue compared to H1 FY17. Vodafone reported a service revenue of Rs. 19,002 crores in H1 FY18, down from Rs. 22,579 crores it reported in H1 FY17. “Due to the continued price competition from new operator and incumbents, seasonality and GST, Vodafone service revenue at Rs. 19,002 crores in H1 FY18 (down by 15.8%),” said Vodafone in its press statement. Vodafone’s EBITDA stood at Rs. 4,075 crores in H1 FY18, delivering an EBITDA margin of 21.4%. During the same period, Vodafone’s subscriber base grew by 3.3% YoY, ending at 207 million customers, serviced through a network of more than 140,000 network sites. Vodafone also reported a substantial rural presence with a customer base of 114 million as of September 2017. The service revenue ARPU stood at Rs. 146 in Q2 FY18, and the revenue market share grew by 23.1% in Q1FY18, a 0.6% increase compared to Q1FY17. The second largest telecom operator in India also recorded stable growth in the data segment. Vodafone registered a total 67.7 million data users, and of which, 44.6 million customers use data more than 1MB. The company also added 10 million broadband users YoY to close at 46 million 3G/4G subscribers. Furthermore, it said the data usage is exploding and usage per subscriber (>1MB for Q2FY18) is 2.7GB per month. The data usage growth is led by higher smartphone penetration at over 38% of the total customer base as of September 2017. “Driving data usage with innovative value propositions, strong content offerings with Vodafone Play, Netflix and Magzter in addition to strategic partnerships with handset manufacturers and application providers,” said Vodafone in a press statement. It also revealed that the company now has 13.85 million customers using M-Pesa along with 1,41,000 merchants on board. At the same time, Vodafone also reported a strong foray into the Internet of Things (IoT) solutions and investing in Cloud (SaaS) with the addition of Workforce Essentials and Vodafone CRM. The operator also actively engaged with Public Sector Enterprises and State Governments contributing to the vision of Digital India and setting up of smart cities. Vodafone expanded wireline services with the introduction of Super WiFi hotspot stations in bus stops, and also launched a unique start-up proposition to empower start-ups on their growth and innovation journey.